For the longest time in the ”sports” they call boxing, fighters at the lowest spectrum of the “weight divisions” had been ignored. Although these puny little guys also sacrifice and at times offer their lives for the entertainment of the fans, they are always relegated to the short end of the stick. Case in Point: The Licona vs. Barriga IBF Title Fight. Carlos Licona of Westminister, CA battles Mark Barriga of the Philippines for the IBF Strawweight title at the famed Staples Arena in downtown Los Angeles on Saturday. True, they are part of the undercard for the huge heavyweight fight between Deontay Wilder and Tyson Fury. That, as many say, is recognition enough for these tiny fighters- so what’s everybody complaining about? The truth is the Licona-Barriga fight was placed on the undercard of a huge fight because that is the safest way for those involved in the promotions to recoup their investments. The Licona vs. Barriga fight will be a sure loser in terms of returns on investments if it was the main event in any card in the US. Fight fans, except the purist, more often than not, will not spend money to see these little guys. Little guys seldom create spectacular knockouts, something bloodthirsty fight fans want to see for the money they pay. Thus fans, particularly the casual ones, stay away from the lowest weight fighters forcing promoters to produce different ways to make fights between little guys happen. One of those is inserting the fight in big fight cards. “It’s all about the Benjamin’s,” one old sly fox of a promoter once said! The sad part is he is right! Little fighters generate equally little in ROI, therefore they are many times ignored. Reports from Nick Giongco who was as the Press Conference today at the Westin Bonaventure Hotel for the fight card happening on Saturday between Wilder and Fury, indicate that Licona and Barriga were left out as the presser got underway. “Guess the focus is on the big guys, heavyweights,” he stated. Licona and Barriga’s fight is for a world title! Would it be possible the promoters considered an IBF title second-class? I don’t think so. I think it’s more about their potential to make money for the promoters. 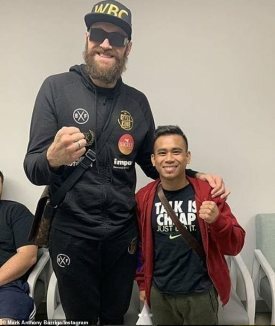 In my opinion, they believe that even without giving Licona and Barriga exposure during the PressCon, the money will still come because the real money maker for the fight card are really the big boys. Thus the focus is on them. I salute matchmaker, Sean Gibbons of Las Vegas, for his work to place the Licona and Barriga fight on the card even only as a “filler”. I say a “filler” because in spite of the fight being for a world title, it will not be part of the televised fights on ShowTime! But, that’s okay if the fight is not shown live on PPV and respects to Gibbons for making it happen, and giving both Licona and Barriga a way to make a living. Hopefully, it will be shown in the Philippines to give the Filipinos a chance to see their compatriot fight live in Los Angeles. It’s sad that things had to be this way. But that is boxing. The focus is not really on the fighters, particularly the little ones. The focus is on money. They don’t call it a “prize fight” for nothing!